Clorox's first-quarter results arrived with uneven segment performance, but overall sales and earnings growth was encouraging and suggest that the company's acquisitions strategy is paying off. Shares of Clorox (NYSE:CLX) gained 11.6% in November, according to data provided by S&P Global Market Intelligence. 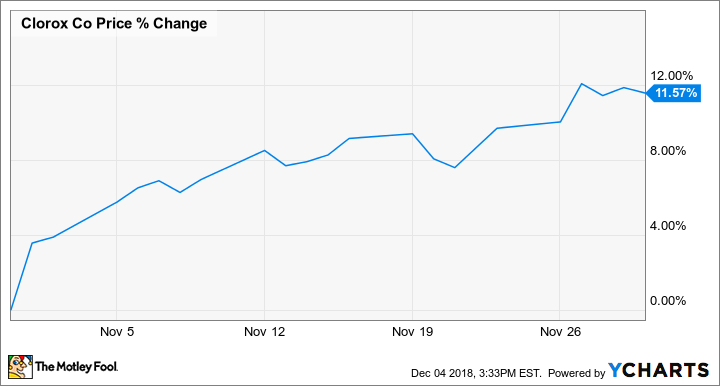 The stock rose following the company's first-quarter earnings release at the end of October and continued to move higher last month. Clorox reported first-quarter results after market close on Oct. 31, with sales and earnings for the period coming in ahead of analyst expectations. Revenue for the period grew roughly 4% year over year to reach $1.563 billion and surpass the average analyst estimate by $26 million. Adjusted earnings per share for the period rose 11% year over year to $1.62, topping the average analyst estimate's call for earnings of $1.59 per share. Clorox's cleaning products saw a 2% year-over-year sales increase and a 5% pre-tax earnings increase. Combined revenue for the company's bags and wraps, charcoal, cat litter, and digestive products was flat, but pre-tax earnings for the segment fell 19% as a result of higher manufacturing and materials costs. Its lifestyle segment (which includes food and water-filtration products, personal care items, and dietary supplements) recorded a 26% year-over-year revenue increase thanks to contributions from the Nutranext business that Clorox acquired in April, but earnings dipped 3% because of higher manufacturing costs. International sales fell 5% compared to the prior-year period, but pre-tax earnings for the segment increased 22% thanks to pricing hikes and cost-saving initiatives. Clorox reaffirmed its guidance for full-year sales growth to come in between 2% and 4%, suggesting a revenue target of roughly $6.31 billion at the midpoint. However, the company lowered its earnings target for the year as a result of currency headwinds and its decision to repurchase fewer shares. Management now expects full-year earnings to come in between $6.20 per share and $6.40 per share, down from its previous guidance for per-share earnings of between $6.32 and $6.52. While Clorox stock has recently seen big gains and trades at roughly 25 times this year's, the stock could still have appeal for investors seeking defensive stocks amid concerns that the market is headed for a prolonged bearish trek. The company's portfolio of consumer staples products has historically been resilient amid economic downturn, its stock offers a 2.4% yield, and the company has delivered annual payout growth for 41 years straight -- characteristics that could help the stock outperform in a bear market.